At The Blue Elephant, we have one simple mission: make every day your child’s best day! 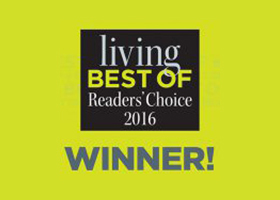 As a premier early learning center serving children throughout the Frisco, TX area, we take pride in helping our toddlers grow both emotionally and socially. With our fun themed rooms, each day is a new adventure! Toddlers age 18-23 months are in our themed Zoo Room, young 2’s are in our themed Jungle Room, and older 2’s are in our themed Beach Room. 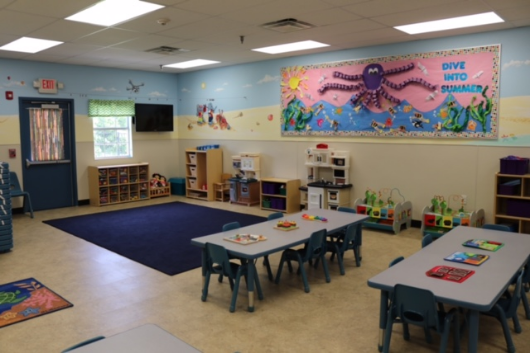 All three of our toddler classrooms are designed for age-appropriate fun and instruction. 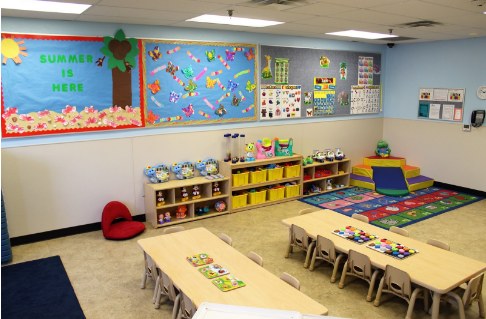 From corner climbers to tiny tables and chairs, these rooms help our students master milestones. Our Zoo Room for our toddlers aged 18-23 months. Our teachers are truly the heart of our Toddler Education Program, and we are so fortunate to have such kindhearted and experienced educators at The Blue Elephant. Our teachers manage each classroom using two main methods: positive reinforcement and redirection. Positive reinforcement is a technique used by parents and caregivers to change their children’s behavior by reinforcing desired behaviors. This is done with verbal praise or a physical reward. Redirection is an effective way to teach young children the difference between acceptable and unacceptable behavior by redirecting their attention to another activity, item, or idea. Redirectionis a “change of gears” in order to change the unwanted behavior. Our toddlers bring out their creativity through our Frog Street curriculum for toddlers. We also encourage and promote creativity through theme-related crafts, as well as music and movement activities. Going on a bear hunt and marching to “We Are the Dinosaurs” are toddler favorites here at The Blue Elephant. Our Beach Room for our older 2’s. If you have any questions or would like to find out more about The Blue Elephant, please contact us to schedule a tour of our Frisco, TX private preschool. You can also reach us by phone at 469.287.0332 or by email at info@theblueelephant.com. If you’re eager to join The Blue Elephant family, we encourage you to apply today. We can’t wait to hear from you!